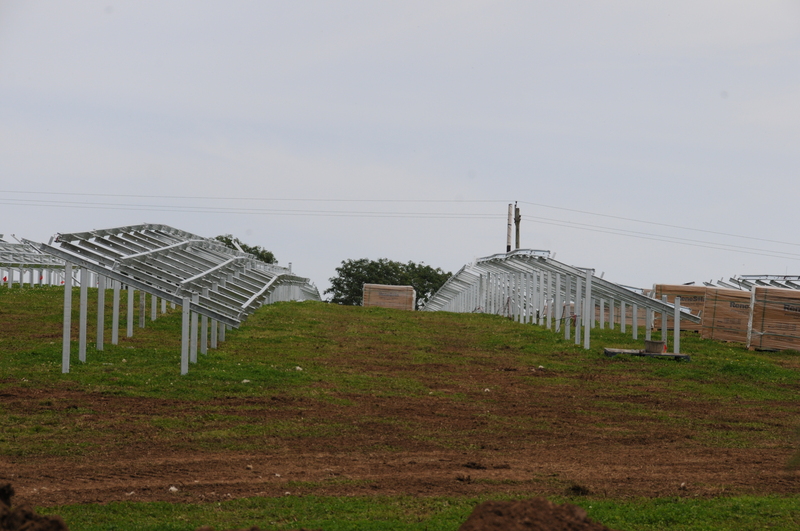 Kelly Solar Farm – Progress report! | MABRAKE – Milton Abbot, BRadstone And KElly Action group. 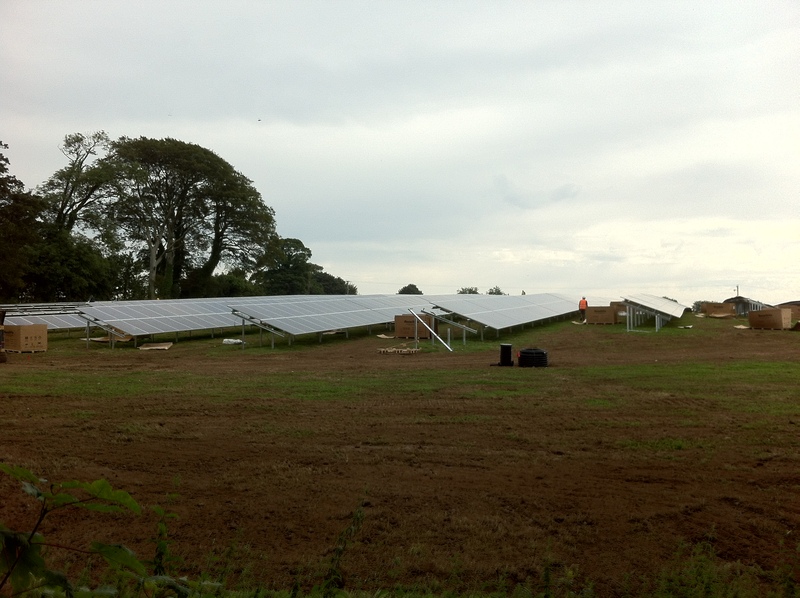 Kelly Solar Farm – Progress report! The work started on Monday 12th August and has advanced extremely quickly! A large number of HGV’s arrived with the Solar Panels all manufactured by ReneSola, a Chinese company. (See http://www.renesola.com for full details) Each panel can generate 250w so to produce the promised 1.3Mw, 5200 panels have been delivered. 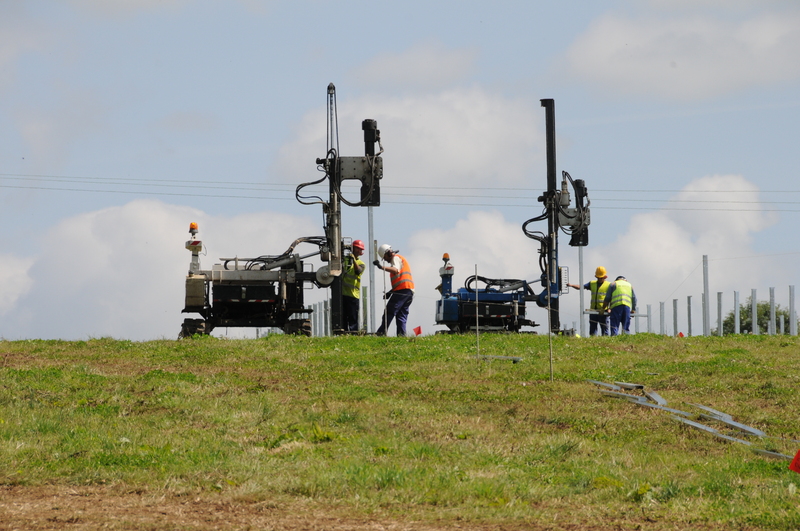 Four vertical posts support six panels which meant roughly 3400 piles have had to be driven into the ground which at times has been extremely noisy and very tiring as the team have been starting at just after 7am and finishing around 8pm! The above photo shows the two Pile drivers passing each other. Once the vertical supports were in place the horizontal supports were quickly erected with the staff working quietly all night on several occasions! The above photo was taken one week after commencement and today (Friday 23rd August) the majority of panels have been installed on the bottom half of the field nearest Kelly! The Freesun Inverters made by Power Electronics in Spain were delivered yesterday and it is my understanding the majority of equipment is now on site with the construction phase being completed by the end of August! The connection to the main electric supply was achieved in just a few hours by Western Power on Thursday. So to sum up, the Solar Panels have been manufactured in China, the Inverters in Spain, and the majority of the construction team is mainly Spanish! Need I say any more? Finally, all the staff including the couple of Brit supervisors have been extremely friendly and helpful, keeping the noise to a minimum whenever possible and keeping the road spotless. So far I don’t think anyone can complain!